We acknowledge your loss and stand ready to help you create a memorial service that truly honors your loved one’s memory. 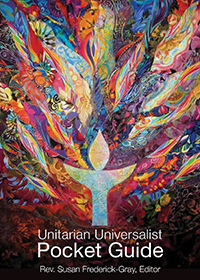 Unitarian Universalists affirm the inherent worth of all people. We respect your personal beliefs and faith traditions. Memorial services are crafted to reflect the personality of the deceased and your family. If you would like our minister preside over a funeral or memorial service, please get in touch so we can start to make arrangements. If she is unable to officiate, our minister will work with you to find another officiant. Our facility is available for rental. However, all memorial services must be scheduled in consultation with the minister.